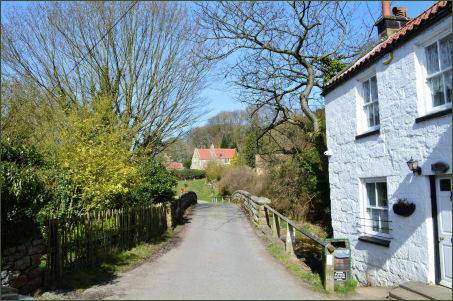 The idyllic North York Moors village of Beck Hole lies at the base of a steep hill in the wooded valley of the Murk Esk River, a tributary of the River Esk which flows on to meet the North Sea at Whitby. 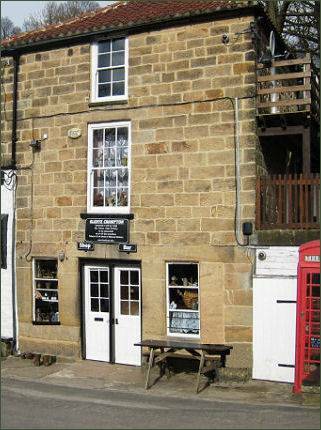 The village is around 1.25 miles (2 km) to the north-west of the village of Goathland. 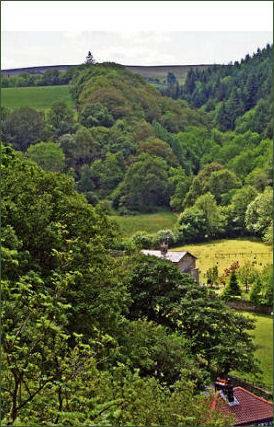 The village's curious name derives from the Old Norse description of 'a deep valley through which runs a stream'. During the Middle Ages it was set in the great Forest of Pickering, which began to be cleared in the thirteenth century. The earliest record reveals only one farmstead in Beck Hole, which was originally known as Amerholm, in 1572. The farmstead was owned, according to the Duchy of Lancaster Rent Roll, by William, John and Maryann Ducke. The farm must have prospered as they built a big fulling mill for the preparation of fleeces on the bend of the river. The earliest known public house in Beck Hole is recorded in 1678 when the The Bulls Head stood at the far end of the hamlet, it was re-named 'The Lord Nelson' in 1801, and was re-built in 1850. 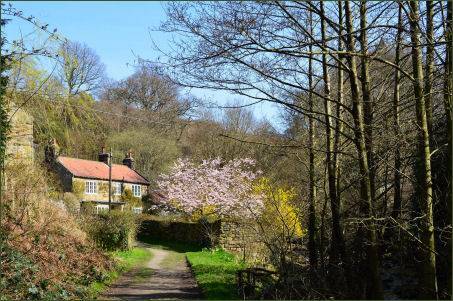 The North Yorkshire Moors Railway passes the village close by to the north. The current route was created in 1865 to allow steam trains to travel the entire route, replacing a complex arrangement of water filled tanks used to raise and lower carriages. 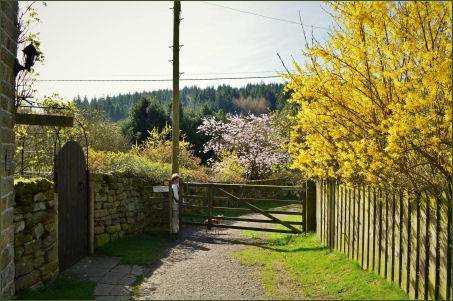 The old route is now a footpath, leaving the current route at Moorgates, one and a half miles south of Goathland, and rejoining it a mile and a half north of Beck Holes. The small village's houses nestle around an old fording point on the Eller Beck, just before it meets West Beck to become Murk Esk. 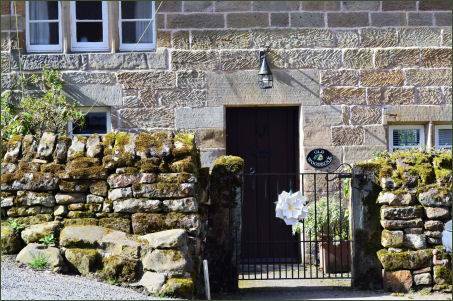 The characterful Birch Hall Inn (pictured right) has two bars, serves food and has a fully stocked sweet shop in the middle and a terrace-garden at the back back with outdoor seating. The sweet shop opened in the 1860's to sell provisions to the many miners and railway workers and their families who moved to Beck Hole in the boom time of the Industrial Revolution.Evidence exists that a building occupied the site dating to at least the seventeenth century, the present building is believed date to the mid or late eighteenth century. Most of the of the structures in Beck Hole are listed buildings, these include several eighteenth century sandstone buildings: the Birch Hall Inn, Fir Tree farmhouse, Brookwood farmhouse, the White House and Old Woodbine. 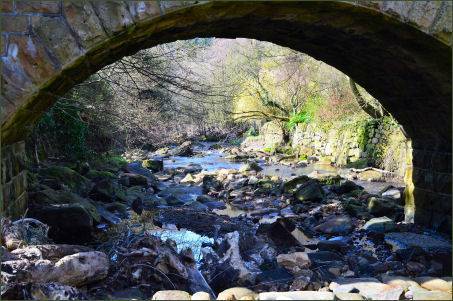 The nineteenth century stone bridge over the Ellerbeck is also listed. Thomason Foss (OS Grid Reference- NZ 826 021), situated about half a mile to the east of Beck Hole, is a small but highly picturesque waterfall located in a tranquil picturesque dell, surrounded by woodland. 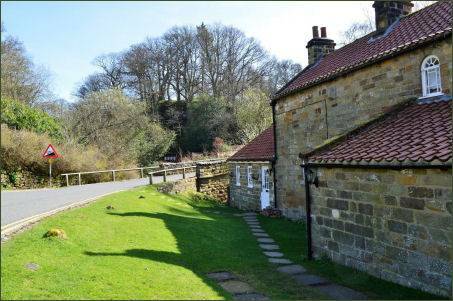 It has a lovely scenic backdrop as Eller Beck is crossed by a bridge carrying the North Yorkshire Moors Railway. 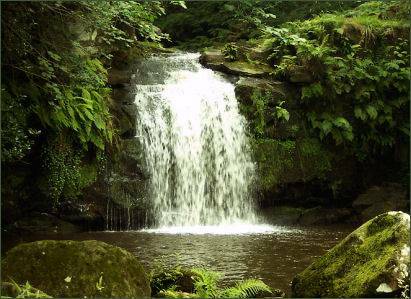 The waterfall is accessed via a footpath from the village, starting at the bridge next to the Birch Hall inn, it runs alongside both the North Yorkshire Moors Railway and Eller Beck.